Sharing photos on a disk is a smart option, but what if you have just one image to share or you want to share pictures with a large group? Digital photography makes it easy to show people your images—you can share the same digital image with many people without having to physically copy it. You just took an adorable photo of your grandson, and you want to share it with a friend. After you’ve transferred the image from your camera to your computer, the rest is easy. Start by addressing an e-mail to the person with whom you wish to share the photo. On the e-mail form, click “Attach File.” You’ll be directed to select an image from the files on your computer. Select the photo and click “Open,” and it’s “attached” to your e-mail. click “Send” and it’s on its way to your friend. Once your friend opens the attachment, he or she can view the photo. You’ve taken many wonderful candid shots at a family reunion. You have no desire to e-mail multiple photos to 50 people, but you know that they’d love to see the pictures. A good solution to this problem is posting an album full of photos to the web and then letting your family and friends know where to find them. Where to Show Off Your Photos? Picasa offers a simple solution for uploading images to the Web, but there are many other options available, depending upon your needs. Flickr.com is a well-established photo site, and if you’re serious about photography, it’s a great place to show your work to people who will recognize your ability. Other options include Snapfi sh.com and Shutterfl y.com; both specialize in helping you build and publish photo albums. There are many different websites that host photos (see sidebar), but if you’re using Picasa to edit your images, you can also use it to post them to a private or public website. 1. After you’ve created an album with Picasa, right-click on the name of the album. 2. You’ll see an option called “Upload to Picasa Web Albums.” Click on that option. 3. You’ll see a form. Fill it out and be certain to indicate whether the album is open to the public or only to people with a direct link or a password. 4. Click “Upload”; the photos will be uploaded to the web. 5. You’ll see a screen that offers the option of viewing the album online. Click on that box, and you’ll be taken to your online photo album. 6. To share the album (unless it’s strictly private), send the link to family and friends. They will be able to not only view the pictures but also copy them to their own computers, share the link with others, and print out the photos. As mentioned earlier, it’s possible to skip the computer altogether and simply have digital photos printed from your memory card at a store or kiosk. But what if you’ve uploaded and edited your photos? How can you have them printed? You can copy the images back onto your memory card and take it to the store, but there’s another option that requires less time, energy, and gasoline. Picasa offers you a simple tool for ordering prints from a Picasa album you’ve uploaded to the web (or a Picasa album a friend has shared with you). From the website on which the photos are hosted, click on “Prints” (near the top of the page) and then select “Order Prints.” You can order your prints from one of several sources, such as Walgreens. If you’re not working from photos that have been posted to the web, there’s another option. Open your browser and look up your favorite (or nearest) retailer with photo services. CVS, Walmart, Target, Walgreens, and many other stores offer photo printing. Follow their instructions to upload and order prints. Here are instructions for using the Walmart photo service; all of these services are similar. 2. You’ll see a page full of print options, including various sizes, novelty options, and even options for creating Christmas cards. For the moment, assume that you’re interested in 4X6 prints, so click on that option. 3. Follow the prompts to create an account so that the store can process your order and deliver it to the correct address. After that’s done, you can sign in at any time with your password. 5. After you’ve uploaded all the photos you want to print, click “Add to Cart.” It’s at this point that you’ll select the size, quantity, and finish of your prints. You’ll also have the option of having the prints sent to any address or addresses you like. Of course, you’ll also have to provide your credit card information. Walmart and other stores offer the option of pickup or delivery; delivery, of course, costs a bit more. What’s the coolest way to display a digital photo? In a digital picture frame, of course! And these days, not only are digital picture frames beautiful, but they’re also multitalented. 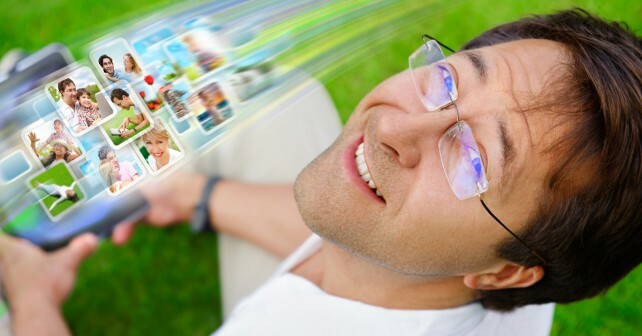 A good digital picture frame can show off your digital photos as a slide show (at any speed you select) while also off ering the options of showing video, connecting to the web, and playing sound. In fact, today’s digital picture frames can even be accessed from a distance, so your family and friends can add images to your collection from the other side of the world (for better or worse). As with most electronic devices, digital picture frames can cost very little or quite a bit: Prices range from about $30 for a basic model to several hundred dollars for a system with all the bells and whistles. Of course, you probably have a fairly good idea of what you want in a digital frame already, but in case you’re not sure how far you want to go, you can research your options. PC Magazine’s website’s coverage of digital picture frames (www.pcmag.com/reviews/digital-picture-frames) includes an interactive selector that allows you to choose the features you want and then read reviews of individual frames. You can also go to Amazon.com to look at individual frames, read user reviews, and then make your purchase. © 2016. Publications International, Ltd. All Rights Reserved.